Where Did My Happiness Go?) asks the three stars in Orion’s Belt: Where did my happiness go? Historically, the Three Sisters, also known as Las Tres Marias, have been timekeeping markers as well as guides for orientation. In this installation of new works, Liebana questions traditional notions of objectivity and the trustworthiness of perception. The life-size sculptures and ceramic self-portraits represent her identity as a female artist of color, and how society shapes her awareness of herself and her value in a capitalist patriarchy. 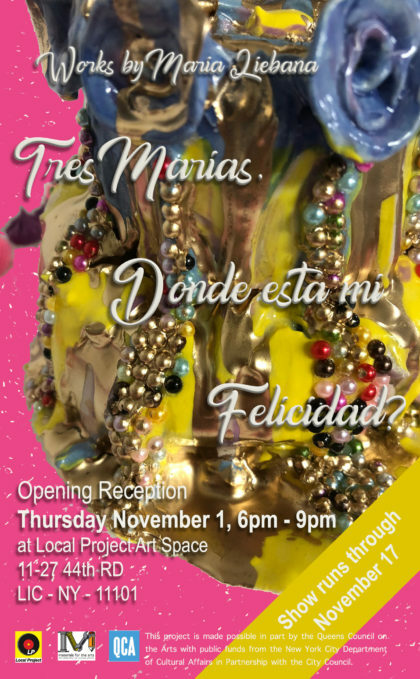 About the Artist Maria Liebana is a first-generation Latinx artist based in Queens. Her artistic practice is shaped by her liminal ethnic status, underground cultures, and conventional sexist attitudes toward kitsch. Liebana holds a BFA in Art and Design Education from Pratt Institute and an MFA in Studio Art from Maine College of Art. She has exhibited at Field Projects, Local Project Art Space, Trestle Contemporary Art Gallery, Ground Floor Gallery, and Helen Day Art Center. She attended Vermont Studio Center and Pickwick Independent Press in Portland, Maine. She is a 2018 Queens Council on the Arts New Works Grant Artist recipient. About Local Project Local Project is a nonprofit organization committed to building an educational forum for emerging artists of exceptional vision, and creating synergy between the exhibition of their work and the public. Founded in 2003 by a group of artists and friends, LP is committed to offering year-round exhibitions, arts mentoring, classes, coworking spaces, art residencies, and bilingual programming, while building bridges with other institutions. This event is made possible in part by the Queens Council on the Arts with Public Funds from New York City Department of Cultural Affairs in Partnership with the City Council.